A sight to see, I must say. Back in June of 1997, Alois Ruf had just put the finishing touches on the 11th production model CTR2. However, the 11th production model wasn't just another CTR2...It was the first of two CTR2 Sport versions. The Sport version of the CTR2 was developed by the Ruf engineers with the help of Steve Beddor, top Ruf Racer. Steve had driven the 'regular' CTR2 many times, but felt it needed more tire and a wider track, as well as a shorted range of gears in the box. Engine would remain the same. The result came in production #11: A fatter, wider, better handling, better sticking CTR2. Did I fail to mention it has 4 wheel drive as well? Alois also used composite materials for the hood and doors, to save weight. The front fenders aren't just flared out then back in, but are designed to create the "shark gill" look found on the early Porsche RSRs, and make for better continuity. The rear wells are extremely flared out giving the car a massive, hunker-down look, thus spawning the nickname "Fatboy" for the CTR2 Sports. #11 was finished in the classic Yellow paint which was made famous by the original CTR, the "Yellow Bird." It was completed, put on the truck, and taken to be flown to America. Ruf and his employees saw their finished product for merely an hour or two before shipping it off. Not too long after, Production model #12 was finished, the second of the two CTR2 Sports. Identical to the first, it too was shipped directly to America. Meanwhile overseas, Steve and his brother David Beddor, were getting ready for the Virginia City Hillclimb and the debut of the 2 Fat-Boys. Frank, their father, was also gearing up to run his own CTR2, production model #1, up the mountain. They arrived in Virginia City with the Black CTR2 and the 2 new Sport models, Steve's with 50 miles on it, and David's with only 2 miles! Now to give you a little background on Steve and the Virginia City Hillclimb (VCHC): The VCHC is a curvaceous 5.2 mile section of paved highway starting in Silver City, Nevada, and ending at the gold mining town of Virginia City, some 1,200 more feet up. The running of the VCHC is organized by the Ferrari Owners Club and the Audi Quattro Club. Eligible entrants include any street licensed and insured sports cars, from any marque. Typical competition might include a Lamborghini Countach, Dodge Viper, Ferrari Testarossa and F40, Acura NSX, RUF Ultimate, Lotus Espirit, as well as a host of others. It's all in good fun, and there is no prize for winning---just the bragging rights until next year! Steve Beddor holds the record at 3 minutes, 21 seconds, set back in 1994. 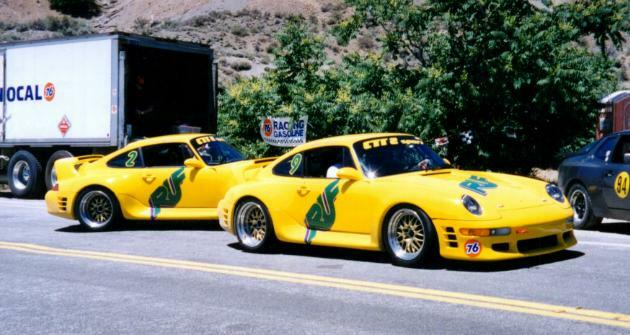 He was piloting a Ruf Carrera 4 CTR (964 based). He has won the event a couple of times, as well. In 1997, though, he brings the CTR2 Sport up for a challenge! Unfortunately, though, the two CTR2 Sports begin "choking" during runs up the hill. They seem to run fine during idle and easing around, but the cars studder and choke during runs up the hill. After some intense scouring, it is revealed that some unforseen problem occured in the fuel routing--THE CARS WERE PULLING TOO MANY LATERAL G'S!! Alois had really outdone himself this time. Made a car that cornered TOO good! Unable to make the necessary adjustments right then and there, Steve and David parked the Sports and did their runs in Frank Beddor's Black CTR2. Even working triple overtime, the black CTR2 performed flawlessly, and Steve beat out the Ferrari F40 to win the Hillclimb! They could only imagine how much the CTR2 Sport would have shattered the record by. In the end, the problem was corrected after the race, and the Fat-Boys went onto an outstanding performance in July at the Pikes Peak International Hillclimb. 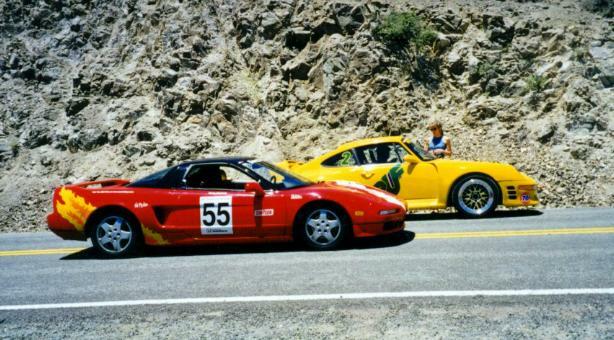 But, as for Virginia City, look for those yellow CTR2 Sport models in 1998! !